Changlang district has wide range of latitudinal variation ranging from 200 metre to 4500 metre from sea level sprawling over lush evergreen forests overhauling beautiful hills and rivulets over the Patkai Mountain range in the Myanmar border of northeast corner of India. There are some places, which are situated in beautiful locations. These places are very attractive for seasonal visitors. Seasonal visitors are an important factor in economic well being source of income for the local people. While tourists enjoy their visit, the local people can have the chance of getting a good price for their products and their services. This beautiful and small town is headquarter of Miao sub-division and situated at bank of River Noa-Dehing surrounded by picturesque scenic beauty. The interesting things to see are Mini zoo, museum, Bishop House, Tibetan refugee settlement where colourful woolen carpets of various designs are produced, oil drilling at Kharsang and Manabum. Choephelling Tibetan Refugee settlement camp located at a distance of four kilometers from Miao Township under Changlang district, is one of the oldest settlements for Tibetan refugees. The camp boasts of producing superior quality carpets, a larger portion of which goes to the global market. The raw materials mainly cotton yarn (Rs.150/Kg) and wool (Rs. 200/Kg), procured from Panipat in Haryana and some quantum from New Zealand, are exotically weaved to international standard and sold at Rs. 190 per square feet in the global market. There are 26 high skilled women weavers and six male counterparts in the carpet industry, which on an average earns around Rs. 20 lakh annually as informed by the settlement officer of the camp. The camp is inhabited by 500 families with 2800 members, is one of the 45 settlements in India, of the 75 all over the world. A beautiful Buddhist monastery in the mid of camp is one of the major attraction for the tourist. Vijaynagar is the eastern most people’s inhabited land of our country which is also the remotest Circle (Tehsil) of Changlang district in the north-eastern state of Arunachal Pradesh, India. This beautiful pristine location is endowed with natural beauty and surrounded on three sides by Myanmar while the other side is flanked by the large chunk of thick forest of Namdapha National Park. Nearby towns are Miao which is 157 km away and take about 6 days walk by foot march. The other nearest town located in other districts in India side are Hayuliang and Tezu. The nearest town in Myanmar side is Putao which is 40 km away. Vijoynagar’s local name is “Daudi” called by Lisu (Yobin) people. Vijonagar, comprises of sixteen villages having a population of 4438 people The villagers depend on Wetland and Jhoom Cultivation for their livelihood, and are dependent on rainfall. The Day to day requirement of Groceries is met by a few Shops; and which bring the Stores from Dibrugarh by Air or from Miao on foot. It takes six days to travel on foot from Vijoynagar to Miao. In Vijoynagar, Salt and Sugar are sold at minimum Rs 200 per Kilogram. Limited Civil and Military Helicopters (AN 32) fly from Dibrugarh and Miao to Vijoynagar Airfield which are also very irregular and limited haulage capacity. In that they can take up to one ton load with eighteen persons on board. Previously there were two such Sorties for Civilians and three numbers for Assam Rifle personnel before last Helicopter crashed incidence at Tirap district. As there is no road connection to the area, people are dependent on Military Helicopter for essential services and requirements. Fifty five percent of the population belong to retired Assam Rifle personnel and 45 percent is of Civilians comprising of mainly Lisu (Yobin) people. The settlement of the Assam Rifle personnel began from May 7, 1961 onwards. Prior to 1961, this place was little known to outside World. The villages have a number of Primary Schools. There is Arunachal Pradesh Government run Secondary School up to Ten standard. There are only one or two teachers in each school. Many years back there was a motorable road existing in the area, but due to deterioration, it is no longer exist. The telecommunication facilities are not available, and only Radio Net communications are available in the Assam Rifles Camp. Detachment of Government Agencies like SIB and Arunachal Pradesh Police exist in the area. Assam Rifles camp has limited medical facilities. During emergency medical cases when patients have to be go out for urgent treatment, it is very difficult for people to avail medical facility outside Vijoynagar. The villagers are not covered under water supply scheme and draw raw water for their consumption. Power Department has installed Generator set for Power supply, but due to non availability of funds for procuring Diesel, the Generator is not functional. Few solar power lights were installed couple of years, but they are also not working properly now. Since couple of years, it has been reported that there is proposal from government for construction of road from Miao to Vijoynagar which is yet to be undertaken by the authority. The people of Vijoynagar are eagerly waiting for a motorable road since long at least to minimize their hardship in going in and out from Vijoynagar especially during emergency cases. The road is the lifeline of a developed society; Without road there is no development. It is headquarter of Jairampur sub-division. The famous historic ‘Stilwell Road’ passing through this small town from Ledo, Assam, India to Kunming, Yunnan Province, China via Burma. The World War II cemetery of about 1,000 graves of Allied Soldiers is located 6 Km away from Jairampur at the Nampong road. Historic Stilwell’s Road was constructed by the Allied Soldiers lead by America during the Second World War. It started from Ledo, in Assam, India, one of the railheads of the Bengal-Assam railway in the valley of the Upper Bramaputra, to the Burma Road, which connected to Kunming, China. It passed through Lekhapani, Nmampong and the Pangsau pass on the India-Burma (now Myanamar) border. It wound up the passes of the 9000 foot high Patkai Range and emerged at Shindwiyang and reached Mitkyina. 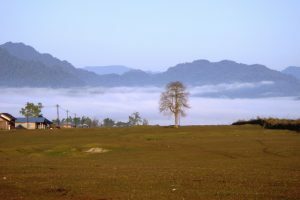 It crosses the broad bowl of the Upper Chindwin, threads the Hukawng and Mogaung valleys, and goes down to Bhamo, eventually connecting to the Burma Road. Much of this road has been reclaimed by the natural landscape, due to lack of maintenance, but portions of it have been and/or are being restored. The recently unearthed large Burial-ground with about 1,000 graves of allied soldiers believed to be mostly of Chinese, Kachins, Indian, Britishers and Americans soldiers who died in Second World War is located at Stilwell Road ( Ledo Road ) in the Jairampur-Nampong road, Changlang district, Arunachal Pradesh, India. The hidden cemetery covered with thick jungles midst of the bank of Namchik River and on the Stilwell Road ( Ledo Road ), 6 km from Jairampur town, 39 km from Ledo and 24 Km before reaching Pangsau Pass ( Hell Pass ), India – Burma (Myanmar) border. The Army has cleared the area and found about 1,000 graves within an area of about three acre. The boundary was enclosed by concrete posts with entrance on three sides. The graves are arranged in five Lines and several rows. A large grave, possibly a mass burial, is in the centre. The bricks were from Ledo AR&T Co’s brick fields, and others marked as B&C-119 and IR.N!C9 were being used. The most of the graves in the Cemetery are damaged due to wild Elephants, wear and tear in the course of time and tempered due to miscreants. Perhaps, this cemetery might have constructed during the construction of the Stilwell Road ( Ledo Road ) from Ledo, India to Kunming, China via Burma connecting the Burma Road beyond Bhamo by allied forces starting from December 1942 to May 1945 in China-Burma-India (CBI) theatre of military operation against the Japanese forces in North Burma. During the construction of road and fighting against the Japanese forces, numbers of allied soldiers were reported to have died due to malaria, dysentery, land slides, enemy fires and other causes. The Patkai range of Indo-Burma border and Shindbwiyang range in north Burma were one of the most difficult terrains in the World where the road construction was carried out by the allied forces led by General Joseph W. Stilwell while fighting against the Japanese forces who had taken over the whole Burma in their hand in 1942. The cemetery was believed to be used for disposal of dead soldiers from site of war front and calamities out of road construction in India and Burma fronts. While trekking and fighting down the Ledo Road to Myitkyina, Burma, the stronghold of Japanese forces, large number of allied soldiers were reported to have died due to Diseases, calamities and missed in action while fighting.The casualties at war fronts in Burma were reported to have been evacuated by C-47’s Ambulance planes and treated at the various base Hospitals at Ledo road and at Ledo, Assam, India and most of the dead soldiers might have disposed off at this cemetery. It is also reported that most of the casualties were treated at the 20th General Hospital, the 14th Evacuation Hospital, or the 111th Station Hospital in the Ledo area. In course of time, those Hospitals have also completely vanished. Nampong is a quaint small town situated in the picturesque scenic valley. All along the way from Jairampur to Nampong one can enjoy the nature’s ride and the sight of beautiful terraced tea gardens. The close proximity of the town is Burma border make it very crucial & important. Three days Border Trading markets are open as Bazar days in a month on 10th, 20th and 30th of the month at Nampong for selling and buying of goods for both Indian and Myanmarese nationals. During these three days, people are allowed to cross international border at Pangsau Pass with due permission from the concern authority. The Government has declared Nampong as international trading hub. 20 Km from Nampong one can see World War II Observatory post at Wintong. The historic Stilwell Road (Ledo Road) passing through the Nampong and goes down to Burma from here. It is threshold of the Indo-Burma (Myanmar) border. The Pangsau Pass, the Indo-Burma (Myanmar) border is just 12 Km away from Nampong where the famous the Lake of no Return can be viewed from the Pass. Nampong and Pangsau Pass were considered to be “Hell gate” or “Hell Pass” due to difficult terrains in the Indo-Burma Patkai mountain Range. Crossing these places toward Burma were considered to be dangerous and hazardous as Hell during the World War II. The famous lake called The Lake of no return in Myanmar side which can be viewed from Pangsau pass is 12 Km away from Nampong. During World War II, large numbers of Aircrafts were reported to have perished into this lake. Perhaps, the lake served the Allied Pilots for soft landing into the lake water during return mission when the Aircrafts got hit by enemy or out of mechanical snags in the Aircraft. The Pilots had chosen this lake for emergency landing in case of imminent Air crush and therefore, many aircraft were reported to have perished in to the lake. The place is worth visiting for enjoying high mountains and rich tradition & culture of the Tangsa community.The place is ideally located in a rural landscape for nature lovers. It is the headquarter of the district. It is well known for two premier institutes namely, State Institute of Education (SIE) and District Institute of Education and Training (DIET) where in-service training is provided to the teachers. The visitors can also see typical Tangsa and Tutsa houses and villages, and can interact with the local people. One can also enjoy fishing in the Tirap River passing through the heart of the town. Visitors can also visit to district museum, district library and district crafts centre where locally made hand-looms and handicrafts are showcased it it. Ranglum: Here one can find crashed Aircraft Debris of world war-II which renew the memory of the War and natural salt-water spring. You can also have a view of Myanmar Territory and Patkai hill. Suitable for trekking. The best time to visit the area is in the month of November-February. Kengkho Village: A beautiful village situated at the bank of Tirap River. It is an appropriate place for visitors to experience the uniqueness of the village. Jongpho-Hate: A village under Yatdam circle is very well known for its holy and religious importance. The very existence of a ‘Shiva Linga’ in the entrance of the village from time immemorial is an astonishing asset. The naturally formed holy idol, which the local peoples called ‘Tangjong’ or ‘Tangyong’ is a unique sculpture of stone portraying both male and female organs. It is the real essence of holiness and existence of the heavenly abode in the Patkai ranges of eastern Himalayas, where it is believed that the Hindu God Lord Shiva once reigned. The villagers share several stories about the spiritual power of Tangjong. They say that it protects them from any occurrence of epidemic or natural disasters. It is also believed that in the olden days when the head hunting was prevalent in the area, the Tangjong used to warn the villagers from the outside attack. 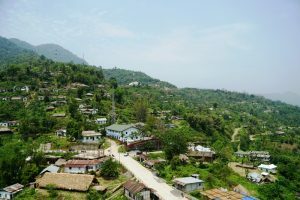 However, the area of the site is not yet developed but one can visit the place in a day, as the road connectivity is up to Sumlam village, which is 8 Km from Changlang and from Sumlam, it is just one-hour foot-march. Thamlom Village: The God too harvest in pristine land of indigenous culture by revealing his power in various forms and styles. The goddess of rain locally called ‘Tsalrong Long’ is one such hitherto unknown manifestation of god’s power in the form of a stone. It is located in Thamlom, a tiny village under Khimiyang circle in Changlang district. As per the villagers beliefs, mysterious phenomenon of it is, when the stone is disturbed it causes continuous torrential rain for days together with dark thick cloud descending upon earth, and bright and sunny weather restores when a person performs rituals and worships it as per the tradition. But the person who performed the ritual has to observe rigid penance of dieting, and he has to be co-operated by the village community the following one day by strictly observing necessary taboos, such as, refraining from potting of water, outing to jungle, cutting of grass leaf etc. As per the villagers story, a lady named Nurap Ngemu discovered the stone while weeding millet crops in her field. The stone, looked coiled up chronically appeared very attractive. She took it to her home. But on arriving, she found dark cloud veiled the entire village and soon unusual downpour followed. An idea and apprehension hit her imagination that the stone she brought might be the cause of such horrible rain; she threw it out of the village. The other day when she got to her work, she was surprised finding the same stone at the same spot where it was found. So, she needed no time to understand it was not an ordinary one. Since then her brother Kamkang took up worshipping it. After his death, family tradition has been continued by his descendents till today. The God really manifests himself in disguise, but people blinded by materialistic modernity and scientific prejudices, fail to identify and understand his manifestations. This type of hidden spots could convert into vital tourist’s attractions at the behest of government sponsorship.